Five dollars buys a reserved seat for an Angels baseball game, followed by a five-hour private party at Disneyland. You won’t even need those pesky “A” through “E” tickets because all attractions are included. You’ll even get to see some radio and TV personalities. Oops! You missed it. The event already occurred. Of course, there’s been inflation since then. According to the U.S. Consumer Price Index, $5.00 in 1967 is equivalent to $37.44 in 2018. Even at that price, it would be a great value. It’s impossible to say what the same thing—a promotional ticket for an Angels game followed by a five-hour private party at Disneyland—would cost today, because there’s no such thing. One-day, one-park Disneyland tickets are now $97.00, $117.00, or $135.00, depending on whether a day is classified as value, regular, or peak. (That’s for all day, not just five hours.) Most seats at Anaheim Stadium cost far less than Disneyland admission, but would still be in addition to it. The Federal minimum wage in April 1967 was $1.40 per hour. Without taking taxes into account, a minimum-wage employee could buy this $5.00 Angels-Disneyland combination ticket with just 3.57 hours of work. Today (2018), a minimum wage employee would not make much of a dent in the cost of a similar outing with just 3.57 hours of work. The Federal minimum wage is $7.25 per hour (with no increase since since July 2009). The California minimum wage of $10.50 to $11.00 per hour, with higher hourly rates in some counties. The “Angels-Disneyland Double Header” advertisement was right inside the front cover of the Spring 1967 issue of Disney News, a quarterly magazine published by Disneyland. A subscription to Disney News at that time was $1.00 for two years (8 issues). The magazine was for members of the Magic Kingdom Club, a discount card program originally launched in 1958 to market Disneyland through Southern California companies, labor unions, schools, and associations. In 1961, the team’s first year, the Los Angeles Angels played at Wrigley Field in South Los Angeles (not to be confused with Chicago’s more famous Wrigley Field). In 1962, the Los Angeles Angels moved to Chavez Ravine, the same stadium that the Los Angeles Dodgers called Dodger Stadium. 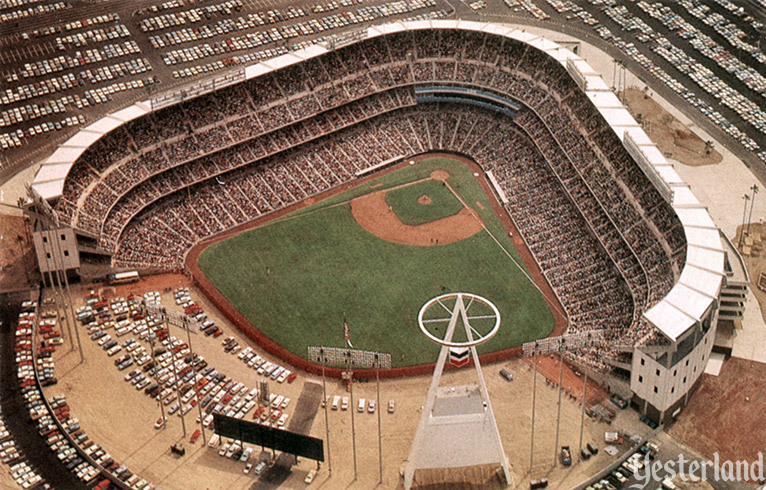 In 1966, the team moved to the new Anaheim Stadium (“The Big A”) and became the California Angels. In 1995, The Walt Disney Company bought a 25% stake in the team from 86-year-old Gene Autry. In 1996, Disney acquired controlling interest in the team. In 1997, Anaheim Stadium was renovated and renamed Edison International Field of Anaheim (or simply Edison Field), and the team’s name changed to the Anaheim Angels as part of the stadium deal. After the 1998 death of Gene Autry, Disney took full ownership of the team. The Anaheim Angels won the 2002 World Series, but Disney CEO Michael Eisner was under pressure to trim underperforming assets of The Walt Disney Company to reverse its declining stock price. In 2003, a group headed by billboard magnate Arturo “Arte” Moreno bought the team from Disney. In 2005, the team took on the unwieldy name of the Los Angeles Angels of Anaheim—the team’s fourth name over the years—in order to be more closely identified with Los Angeles and its huge media market, while still fulfilling a contractual obligation with the City of Anaheim related to the stadium deal. 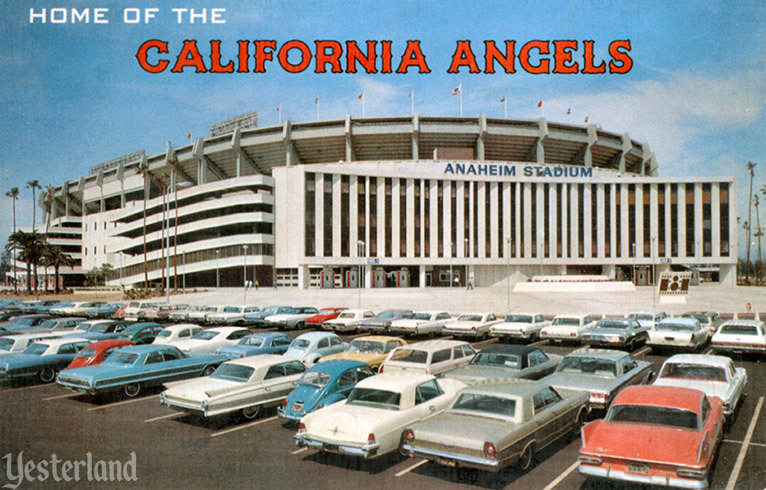 In 2016, the team dropped “of Anaheim” from its name, based on a revised stadium lease, becoming simply the Los Angeles Angels—the same name as in 1961. 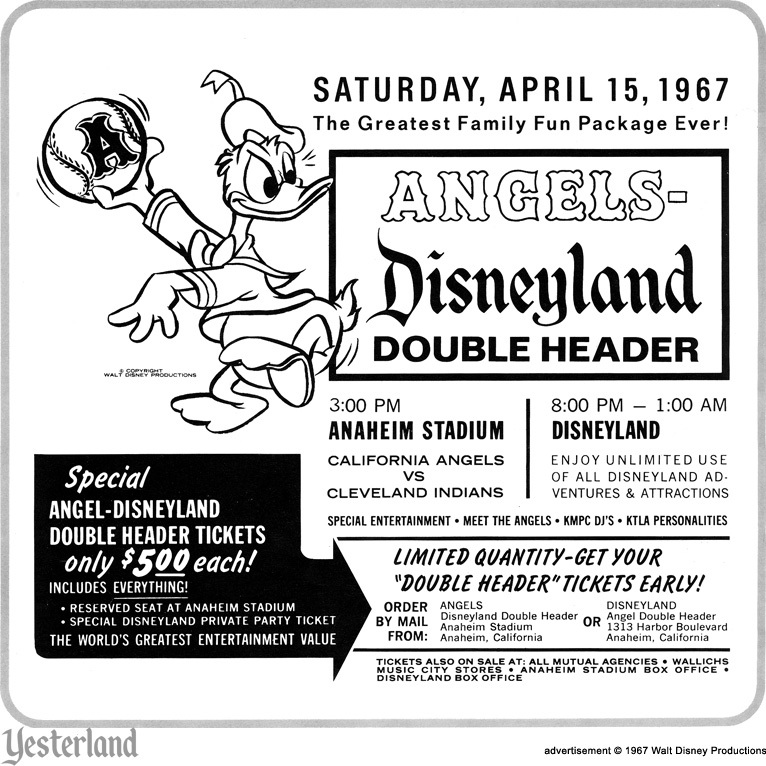 The “Angels-Disneyland Double Header” was an unusual event, but private parties at Disneyland were common during the 1960s and 1970s on weekends in the fall, winter, and spring. 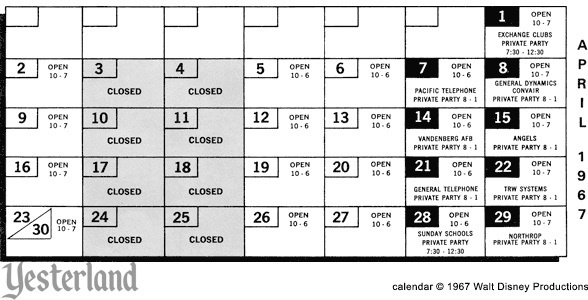 For several years, Disney News even published a quarterly calender that showed the private parties. Disneyland would close at 6:00 or 7:00 p.m., and reopen at 7:30, 8:00, or 8:30 p.m. for guests who had purchased dated tickets through their employer, labor union, church, or other organization. 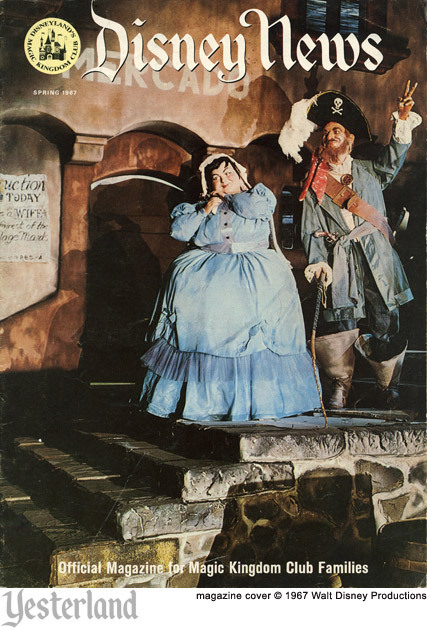 Even though Sundays were school nights, Disneyland figured out how to offer a third private party some weekends by starting the party in the afternoon while other guests were still in the park. Now, to get back to the advertisement at the top of the article... Head over to any Wallichs Music City store with a some five-dollar bills to buy your “Angels-Disneyland Double Header” tickets. While you’re there, check out the genuine Magnavox console color televisions and console stereos, the large collection of vinyl record albums, and the listening booths where you can preview the records. You’ll need a time machine. Wallichs Music City went under in 1978.